Scarlet Cleaner shrimp are popular invertebrates for marine aquarium hobbyists. When kept in groups they are frequently in view during the day when the hobbyist can admire their bright red and white colors. Also, when kept in groups or pairs, the cleaner shrimp often spawn in the aquarium. My plans to try to rear a few shrimp larvae were delayed for more than a year while I searched for a male Scarlet Cleaner Shrimp. I never found the elusive male: Scarlet Cleaner shrimp are hermaphroditic spawners and all members of a mature group produce eggs which are fertilized by another egg producing member of the group. In my area, there seem to be more species of shrimp than there are common names. 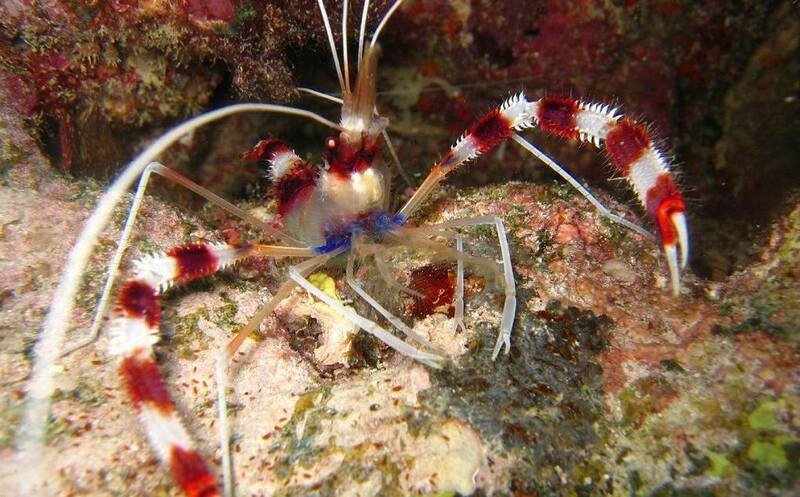 When mentioning cleaner shrimp, readers sometimes think of the large (to 7.5 centimeters), heavily clawed, red candy-striped Stenopus hispidus which are commonly referred to as Banded Coral Shrimp. This article is not about these boxer shrimp. 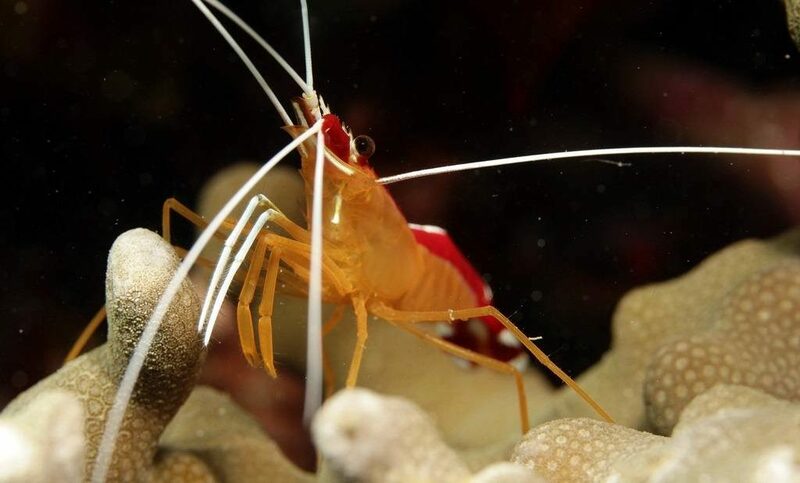 The Scarlet Cleaner shrimp, Lysmata amboinensis, is smaller (to 5 centimeters), has two bright red stripes running from head to tail, a white dorsal stripe terminating at the white-blotched tail fan in an inverted “T”. Lysmata grabhami is a Caribbean Lysmata amboinensis look-a-like, whose white stripe runs to the tip of the tail which is not blotched but edged in white. The cleaner shrimp designation is shared by all of these and several other shrimps. In this article I refer to Lysmata amboinensis as the Scarlet Cleaner shrimp and Stenopus hispidus as the Banded Coral Shrimp. These decapods (10 legs) have different attitudes towards members of their own species as well as different reproductive methods. Please do not confuse these when forming pairs or groups as elaborate techniques are required to form pairs of Banded Coral shrimp from non-mated shrimp. On the other hand, obtaining a spawning pair of Scarlet Cleaner shrimp is quite easy, as any two shrimp are sufficient. Not only can several Scarlet Cleaner shrimp be kept together in harmony in an aquarium, where they make an enchanting display, but they are more often in view when in groups or pairs. All crustacea should be slowly acclimated as they may experience shock if introduced too quickly to a new environment. 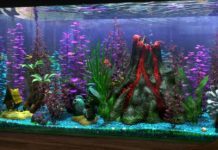 It is particularly important that the temperature in the transfer container matches the temperature in the new aquarium. 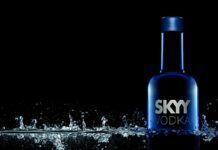 Take the time needed to acclimate them so they can reward you with many years of enjoyment. 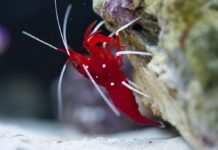 A few rocks or other hiding places should be provided for the initially timid Scarlet Cleaner shrimp; however, after becoming secure with their new home they overcome their shyness and are frequently in view. In their natural Indo-Pacific habitat, Scarlet Cleaner shrimp live together in large congregations of up to a hundred shrimp. They feed by cleaning parasites, diseased tissue, and food particles from fishes that visit their stations. In captivity, they perform cleaning services on tankmates. They flag down passing fish patrons by impatiently wielding their antennae and rhythmically swaying their body. Their tankmates soon tire of the cleaning service and the ravenous shrimp quickly discovers the delights of captive cuisine. They especially relish morsels of crustacea cousins: chopped table shrimp, brine shrimp, and krill. To say that they are bold feeders is an understatement. They react to feeding time with urgent antics that may convince you that they are in danger of imminent starvation. The instant the smell of food enters the aquarium they frantically bound towards the aroma. Their large abdominal muscles make them masters at maneuvering; retrieving floating flakes poses no problem to Scarlet Cleaner shrimp. They swim using the synchronized waving of the five pairs of pleopods (swimmerets) attached to their abdomen. While snaring floating flakes, they appear to be walking beneath the water surface. With the tiny pinchers on their first and second legs, they cram food into their mouth, which is located about one third of the way down the carapace (fused shield covering the head and thorax). They eat so quickly that they appear to be beating on their chest. Their voracious appetite and acute sense of smell entices them to perform scouring duties by cleaning stray food morsels from the aquarium. 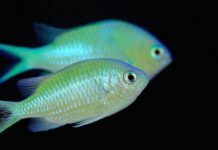 Once hooked on fast food, they seldom volunteer to clean parasites from tankmates. 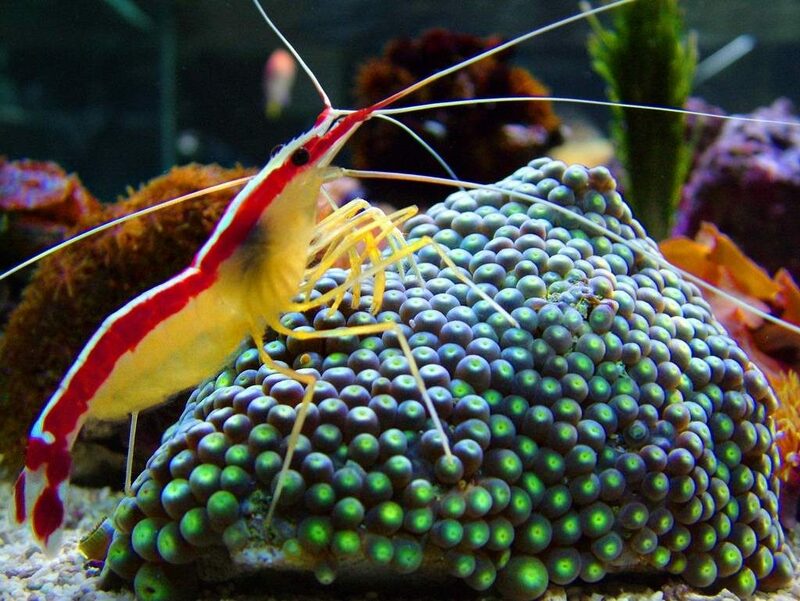 Scarlet Cleaner shrimp are compatible with most fishes, moray eels, and other Lysmata shrimp species. Predator fishes such as Triggerfish and Lionfish should not be tempted with the opportunity to add Scarlet Cleaner shrimp to their menu. Scarlet Cleaners do not attack corals. 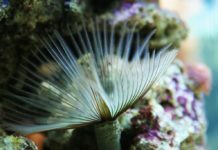 However, they show no restraint and walk on corals with their pointed little legs causing corals to quickly contract at the irritant. Cleaner shrimp may pilfer food from, and pick at, anemones and may not be ideal tankmates for anemones. 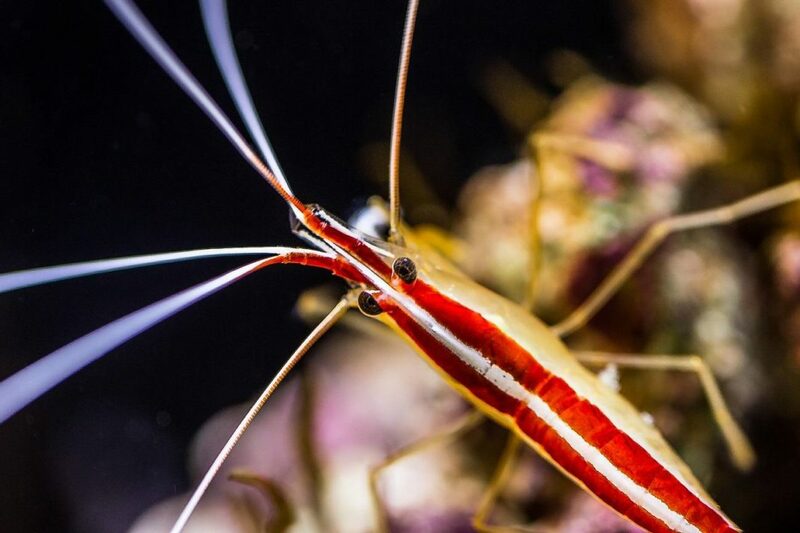 Variable results, perhaps depending on tank size or food rivalry, are attained when mixing Scarlet Cleaner shrimp with Banded Coral Shrimp. Some Banded Coral shrimp attack Cleaner Shrimp while others live in harmony together. Against the ferocious claws of a Banded Coral shrimp, the clawless Scarlet Cleaner has no chance. Arrow crabs also have been known to molest cleaner shrimp. 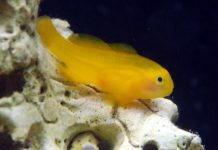 Clownfishes and cleaner shrimp are agreeable tankmates in most cases; however, a case can be made for excluding cleaner shrimp from aquariums with breeding clownfish. I am familiar with a story about a pair of Amphiprion clarkii clownfish which were so annoyed by a cleaner shrimp denying them solitude that one of the clownfish picked up the shrimp and fed it to their anemone. A Maroon clownfish, perhaps mistaking the new crustacea tankmate for dinner, immediately attacked a newly introduced cleaner shrimp. 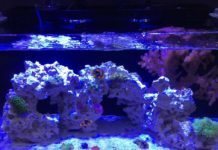 I had a pair of Amphiprion ocellaris clownfish that refused to spawn in the company of a pair of spawning cleaner shrimp. Perhaps spawning clownfish know that cleaner shrimp pose a threat to clownfish eggs which are unattended at night. In the part below we go really deep into the biology of the Lysmata amboinensis and the breeding process of the species. During fertilization, two Scarlet Cleaner shrimp couple, joining at midsection with one shrimp assuming a position underneath the other, soon after one shrimp molts. Apparently, sperm is passed from the hard-shelled shrimp to the recently molted shrimp during this coupling. The recently molted shrimp stores the sperm. Later in the day, the recently molted shrimp extrudes eggs over several hours. The eggs are fertilized, using the stored sperm, as they are extruded. In about a week the second shrimp molts and the two shrimp again couple. This time, the hard-shelled, egg carrying shrimp, passes sperm to the newly molted shrimp. Within a few hours the newly molted shrimp extrudes eggs and now both shrimp carry fertilized eggs. Thus, Scarlet Cleaner shrimp spawn through hermaphroditic reproduction and all members of a mature group carry eggs. Sperm can only be transferred to a recently molted shrimp soon after molting, while the shell is still soft, so two couplings are necessary for both shrimp to receive sperm since the two shrimp molt at different times. Hermaphroditic reproduction is common in snails, with each individual outfitted with functioning male and female organs; however, self-fertilization is not common in hermaphroditic spawners so two individuals are needed. The male organ of one individual fertilizes the female organ of the other individual and vice versa. The male Scarlet Cleaner shrimp organ apparently matures sooner than the female organ as one shrimp in a young pair may carry fertile eggs several months prior to the second shrimp commencing to carry eggs. Complicating the understanding of the reproductive habits of Lysmata amboinensis is their ability to store sperm. One shrimp produces four viable egg clutches after separation from a mate. The eggs are fertilized as they are extruded from a stored spermatophore, a packet containing sperm and nutrients that is passed from the male organ of one individual to the female organ of another individual. 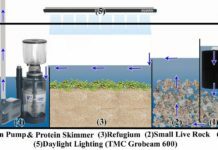 It is not unusual for a single mature Scarlet Cleaner shrimp to spawn several times soon after being introduced to an aquarium containing no other cleaner shrimp. After the stored spermatophore is used up, the shrimp spawns one unfertile spawn which disappears within a day or two. Then the shrimp ceases to spawn until fertilized again. Two shrimp were isolated for close observation. All mature Scarlet Cleaner shrimp are similar in size, shape, and color. It is difficult to discern one from another; however, the shape of the white blotches and the inverted “T” on the tail fan are unique in each shrimp and assist in identifying individuals. Each shrimp molted and produced a new clutch of eggs about every 14 days. Occasionally, the molting and egg-carrying cycle extended to 16 days. Infrequently, the cycle exceeded 20 days. The longer egg carrying cycle followed tank cleanings and water changes. Each shrimp’s egg production cycle was about 7 days out of phase with the other. In other words, each shrimp spawned about halfway through the other shrimp’s egg carrying cycle. During a particularly rhythmic period, one or the other of the pair had new eggs every Saturday morning. During egg extrusion, the adult shrimp severely curls its abdomen and the new eggs are attached to “hairs” behind the first four pairs of the five pairs of the adult’s pleopods. This gives the appearance of four columns of eggs hanging from the adult’s abdomen. Initially, the eggs are green and densely packed near the body. The adult frequently waves its pleopods and washes water across the eggs to aerate them. The adult picks at the egg mass often and occasionally eats something picked from it. About midway through the 14-20 day incubation period, the eggs change from bright green to a light amber color resembling the color of the underside of the adult. As the eggs transition from green to pale amber, the eggs spread out on the pleopods and the eggs, once aligned in four neat columns, appear as an indistinct mound of eggs. The mound of eggs continues to lighten in color and expand in volume until the adult’s pleopods must remain partially open by the end of the incubation period to accommodate the increasing bulk. The day of hatching, a few of the eggs change to a dull silver color. The oval-shaped eggs are 1.2 millimeters long and 0.6 millimeters wide just prior to hatching. For those who have bred clownfish, the silver color of Lysmata eggs prior to hatching is not as shimmering as the silver color observed when light reflects from the developing eye pigment of clownfish eggs on the day of hatching. This is because, like all crustaceans, Lysmata species have compound eyes which scatter reflected light in many directions. A compound eye is like a bundle of tiny lenses, each with a fixed focal distance. The compound eyes give crustaceans a bright, but blurred view of the world. For a tiny compound eyed larvae, floating in the water currents must be like living inside of a kaleidoscope with a progression of visual images coming in and out of focus. The ripe-egg carrying cleaner shrimp can be moved to a larval rearing tank soon after a few of the eggs develop the silver color. In addition to the silver egg color, the refusal of the shrimp to eat in the evening is another clue that the eggs will hatch that night. (Feeding the adult shrimp while it is in the rearing tank is not recommended lest the rearing tank water become polluted.) The adult positions itself in a good current and the larvae hatch from the open pleopods. If the current is not to the adult’s liking the adult shrimp jumps from surface to surface while sweeping its extended abdomen forward to help the larvae free themselves. A mild water current in the hatching tank helps the larvae free themselves from the pleopods. Once the larvae are launched on their larval journey, the adult molts. Broken antennae on a recently molted shrimp is a clue to the hobbyist to add an iodine supplement to the aquarium. The morning after the larvae hatch, the adult should be returned to the main tank. The exoskeleton will still be soft and the coupling of the two shrimp may occasionally be observed within a few minutes of the two being reunited. Careful acclimation is needed each time the adult shrimp is transferred from one tank to another. One of my shrimp would molt whenever it was moved — whether the larvae were ready to hatch or not; however, if the ripe shrimp and its mate were both moved to the rearing tank then the premature molting ceased. Apparently, one of my shrimp is scared out of its exoskeleton whenever it is separated from its mate. When one of these prematurely abandoned molts, with the eggs still attached, was checked under a microscope it revealed numerous partially hatched eggs and several odd-looking little fellows in the hairs of the pleopods. There were appendages, hairs, and tiny spikes pointing in all directions. These “larvae” were customized to snag any soft thing that came near. One might describe the little creatures as resembling escapees from an imaginative Velcro designer’s sketch pad. Were they not microscopic sized they would have been frightful creatures. It appears that the nauplius stage of Lysmata amboinensis occurs within the egg.5 The simplest crustacean larval stage is the nauplius. Nauplii have only three pairs of appendages. The three appendages are the first and second antennae and the mandibles (mouth appendages). In some crustaceans, including brine shrimp, the nauplius stage is a post-hatching, swimming, pelagic stage. Many crustaceans, however, bypass the nauplius stage by developing within the egg. Scarlet Cleaner shrimp larvae have more than three appendages at hatching so it seems that the nauplius stage is passed within the eggs. The hour of hatching is not as precise as with clownfish. My Scarlet Cleaner shrimp hatchings have occurred between a half hour before the lights go off to three hours after darkness. The larvae will swim towards a light as soon as they hatch. Hundreds of larvae hatch, usually in one night, but sometimes it takes two nights; possibly because of interference by the hobbyist with the security of the adult shrimp during the initial hatching. Many larvae can survive being siphoned out of the main tank through flexible tubing. Newly hatched cleaner shrimp larvae are difficult to spot in an operating aquarium. They resemble air bubbles. During a mass hatching, which may be observed if the lights are turned back, on about a half hour after darkness, the larvae are more easily recognized because there are so many of them. One morning while scrutinizing the parent tank for larvae there appeared a couple of air bubbles moving about in an odd, mostly horizontal, trajectory. I could almost convince myself that I was seeing a leg kicking on the odd moving “air bubble.” The most visible part of the larvae, the carapace, measuring 0.75 millimeters long by 0.4 millimeters wide (excluding the near invisible hair-thin tail), is about the size of one day old brine shrimp. A larva can easily be dismissed as just a piece of dust in the water. Once your eyes are trained to see them, you can recognize the tail behind the body and a front spike over the head. Four pairs of appendages flail about the body in their unceasing cooperative search to ensnare the correct morsels of food to make them thrive. Within the first day of life the larvae are capable of picking up newly hatched brine shrimp and manipulating them towards their mouth; however, any brine shrimp remaining in the rearing tank for more than a day become strong enough to escape the ineffectual grasp of the gossamer larvae. Since my adult shrimp found their captive environment hospitable enough to spawn, I was obliged to aid the progeny in their courageous quest to endure. The larvae developed through more than ten “stages” in 39 days and provided me many hours of astonishment. I marveled at the lacework intricacies of each increasingly sophisticated larval exoskeleton. Hopefully, these larvae may be routinely reared in captivity — once the larval life support essentials are better defined. This piece has been written with the help of Jay Hendal and Joyce Wilkinson. Dakin, N. – The Book of the Marine Aquarium. Tetra Press, Morris Plains, NJ. Strynchuk, J. 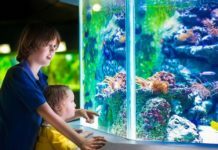 – “An Insight Into the Mating Habits Of The Banded Coral Shrimp.” Freshwater And Marine Aquarium. Debelius, Helmut. – Armored Knights of the Sea. Quality Marine, Los Angeles, CA. Debelius, Helmut. “Cleaner Shrimps of the Genus Lysmata.” Freshwater And Marine Aquarium. Bannister, Keith and Andrew Campbell. – The Encyclopedia of Aquatic Life.